Michele Dutcher specializes in interactive technology/marketing and communications, with years of experience in web usability, information architecture, design/development, content management and marketing communications. She’s passionate about technology usability and human rights. She manages communications in the higher education field and is currently writing a science fiction collection of stories. 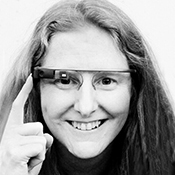 Michele is a Google GLASS Explorer – one of 8,000 in the United States. Google GLASS explorer Michele Dutcher will discuss the varied reactions to this technology ranging from Orwellian fear to Matrixesque blind acceptance. A variety of reactions will be cited. We will examine the psychology behind these reactions to technology (historically and presently) and aim to initiate a culture-wide discussion on being human AND technologically-advanced. Questions we could explore: Does advancing surgical capabilities with GLASS mean conceding to a Dalek-like existence? Will advancing GPS features translate to relinquishing all privacy to the NSA? How is it that in our culture GLASS is simultaneously feared for becoming the gateway to a future of GLASS-wearing human simulators while held to a higher beta stage standard for capabilities? What is the current public comfort level with wearable technology and how does that compare to the onset of past inventions – cell phone/telephone, computer, automobile, air travel.